Upholstered Furnishing Making A Comeback? 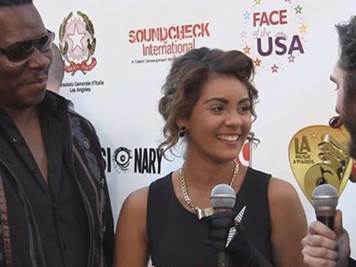 Hollywood, CA – December 6th, 2013 – Australian pop star and award nominated singer song-writer, Taylen (www.officialtaylen.com) is skyrocketing to stardom under the guidance of three time Grammy award-winning producer/mix engineer, David Isaacs. The young Sydney-born singer has been enjoying life in the LA fast lane as she attended the prestigious 23rd Annual Los Angeles Music Awards, last month with Isaacs, where she was nominated for Female Vocalist and Pop Artist Female. Taylen, with Isaacs at the helm, is set to make a big impact in the music industry next year. He has already secured her a manager, who looks after award-winning artists and is in talks for creating ‘Taylen’ merchandise. Taylen, who is currently recording her new album, in the entertainment capital of the world, is also penned to start performing in Greece, Italy, Croatia and the US as early as the summer. Since starting her career in music Taylen has garnered several award nominations including Australia’s 2RDJ-FM and Triple H FM’s ‘Stars Of Tomorrow’ as well as ‘Pop Song of the Year’ at the 2012 Hollywood Music in Media Awards, making her already an international teen pop sensation. Aside from singing and performing, Taylen hopes that her music will provide a new means to give back to her community in Sydney and other charitable organizations from around the world that are close to her heart such as The National Breast Cancer Foundation.